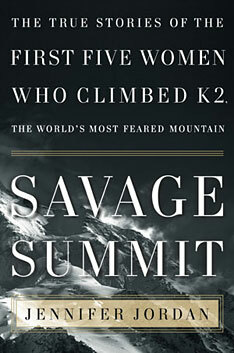 K2 is called the “Savage Summit” and it’s earned the name. Though not quite as tall as Everest, it is far more dangerous. Located at the border of China and Pakistan in the remote Karakoram Range, K2 has some of the harshest climbing conditions and weather of any place in the world. At the beginning of the 2004 climbing season, 90 women had successfully summitted Everest, but only five female climbers had reached the peak of K2. Today, each of those brave pioneers is dead. In 1986 Polish climber Wanda Rutkiewicz became the first women ever to reach the top of K2 and was followed to the summit that same year by French climber Liliane Barrard and British climber Julie Tullis, both of whom died on their descent. Then in 1992, the summer that Rutkiewicz perished on Kangchenjunga, French alpinist Chantal Mauduit summitted K2, and survived, only to die six years later on another 8000 meter peak. 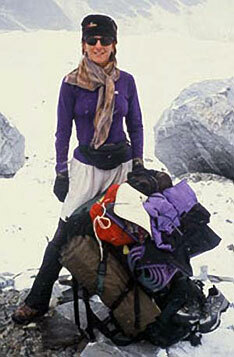 Finally in 1995 British climber and mother Alison Hargreaves reached the top but was killed shortly after starting her descent. These courageous, remarkable women can no longer tell their stories of defeating the ferocious mountain. Jennifer Jordan, a journalist and filmmaker, tells the haunting, compelling, and often tragic stories of how these women lived and died on the mountains they pursued. Mothers and daughters, wives and lovers, poets and engineers, the female pioneers of K2 were complex personalities in the controversial world of high altitude mountaineering, and their lives and deaths are a reminder of the high price climbers often pay to follow their dreams. 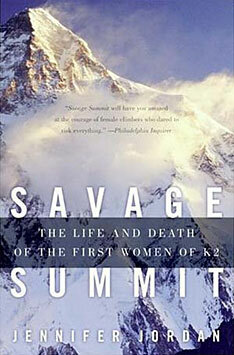 Jennifer Jordan at K2 Base Camp. “My journey to K2, the second-highest mountain in the world, sitting weeks from civilization on the Pakistan-China border, began years earlier when I read Into Thin Air. Like millions of readers who learned the excruciating reality of high-altitude climbing through the story of Mount Everest’s deadliest storm in 1996, I suddenly found myself fascinating with that exotic and ruthless world at 8,000 meters, an altitude above which life begins to die. Who were these strange souls who sought to enter that so-called Death Zone, and why did they revel in the literally mind-blowing experience of having millions of brain cells die in minutes? Wanda Rutkiewicz looked around her at the sea of peaks below; the other 8,000 meter giants, Broad Peak, Gasherbrum I and II, and far-off Nanga Parbat, looked small in comparison. She got up from her knees and twirled around slowly, carefully, on the summit precipice, her crampons crunching the wind-blasted snow, her arms outstretched, trying to embrace the scene, to take a mental image she could never forget. Her smile was so broad that her teeth began to hurt in the sharp cold. She had done it. After three attempts, two lost lives, and four years of trying, she had made it and no one would ever take it away: Wanda Rutkiewicz was the first woman to stand atop the great K2. ‘It was sheer ecstasy being on the summit,’ she said. It would be a short-lived ecstasy. On May 9, 1998, a Nepalese friend of Chantal’s walked slowly through his village. Suddenly a cloud of butterflies appeared in front of him, obscuring everything with their bright fluttering. ‘Putali,’ he said, the world floating among the colorful swarm. Chantal’s love of butterflies had earned her the nickname Putali in Nepal; butterfly. He looked up toward the mountains. ‘Putali,’ he said again; it was a whisper. Without any more evidence than the horde in front of him, he knew something was horribly wrong with Chantal. In 1978 Rick Ridgeway climbed K2 in mid-September after three months of trying. As he stood on the summit his one dim thought was that he ‘should really try to remember this moment, because someday it’s going to matter to me.’ But it didn’t matter then. Then, his only thought was a dull but persistent alarm: How am I ever going to get back down alive? He survived, but had to reach down into the bottom of his reserves, using every last scrap of wits and will to do so.